So far Sharon Hurr has created 49 blog entries. The first planting session which took place on the first 3 days of October was very successful. 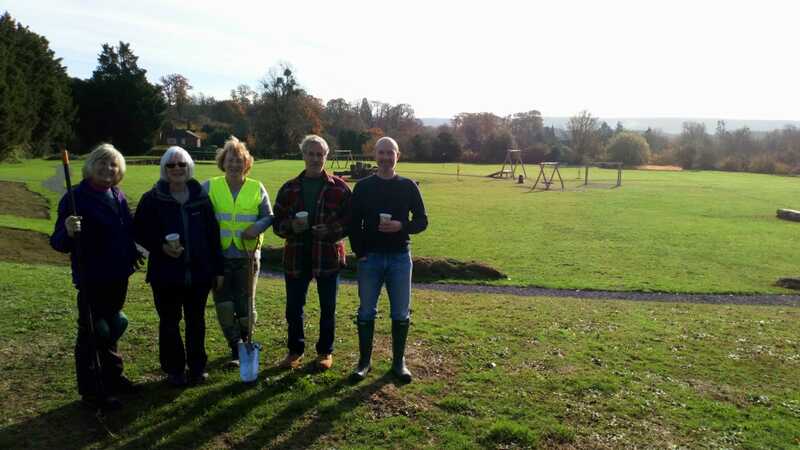 Adult volunteers from the Allotment and Garden Society, the local community, children from Conifers and Easebourne C.E. Primary School, the Rainbows and Brownies planted 1,000 bluebell bulbs and hundreds of wild flower plugs and seeds. Over 90 children helped in this planting session and we were so grateful for their help. 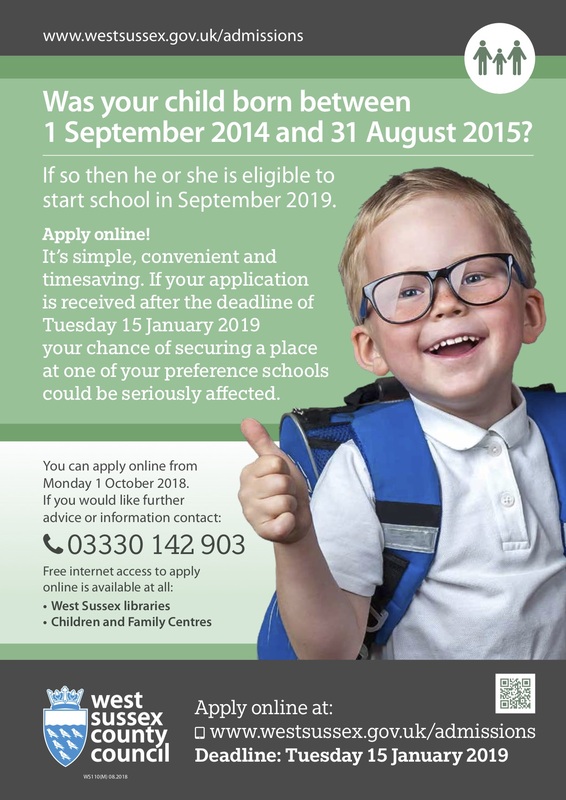 The next opportunity to get involved is week beginning 12th November when we will be planting hundreds of heathers, hedgerow saplings and trees. 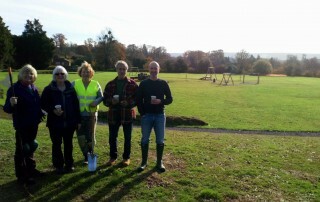 You don’t need to be green fingered to help us with the next phase of the Park, which is due to begin early next month. You can choose to help for a few hours in the morning or afternoon, for the whole day or even more days if you are free! Please bring a trowel and a spade and wear some sturdy shoes/boots, and gardening gloves if you have them. Instruction and a safety briefing will be given prior the planting session by Lawrence of Wildwood. 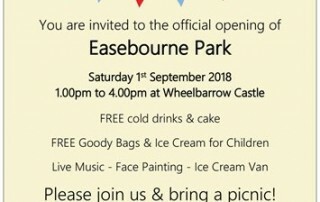 Easebourne Park will be officially opened tomorrow at 1.00pm until 4.00pm. Come along for slice of free cake and a cold drink and listen some live music. Goody bags will also be available for children. So why not bring a picnic and spend the afternoon with us. The inaugural meeting of the Parish Design Statement (PDS) volunteer group will take place in the South Downs National Park Authority’s HQ in Midhurst on 10 September at 1800 where SNDPA’s Chris Patterson will deliver a 30 minute presentation on why a PDS is a very good thing to achieve and what creating this important document entails. 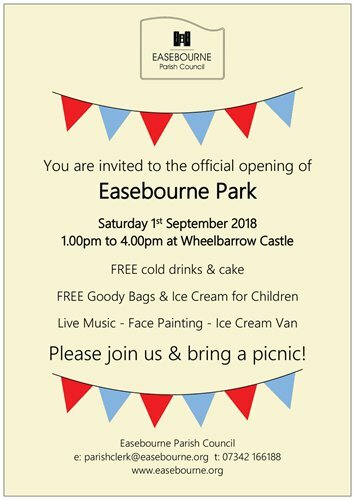 Even if you have not signed up as a volunteer, please do consider attending this key meeting for Easebourne Parish. Due to limitations on numbers in the SDNPA meeting room, if you plan to attend, please let the Parish Clerk know beforehand. 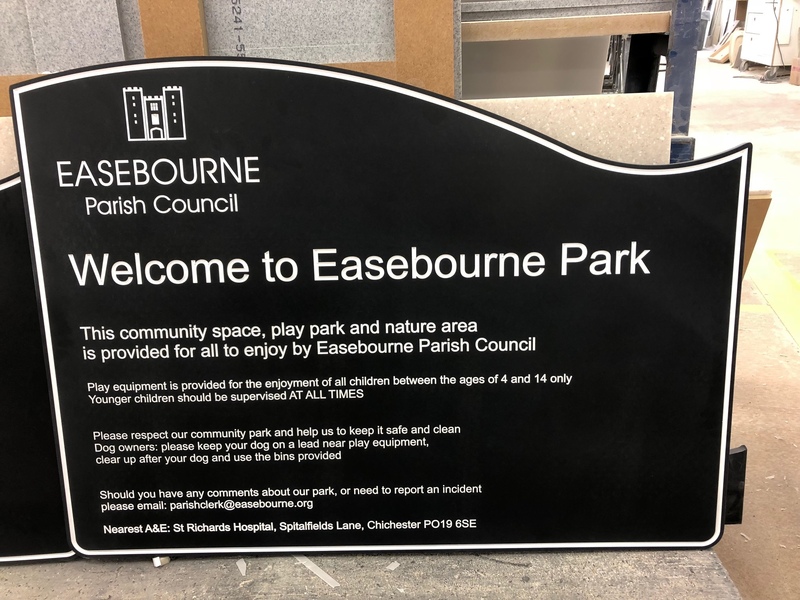 The signs for Easebourne Park are installed! 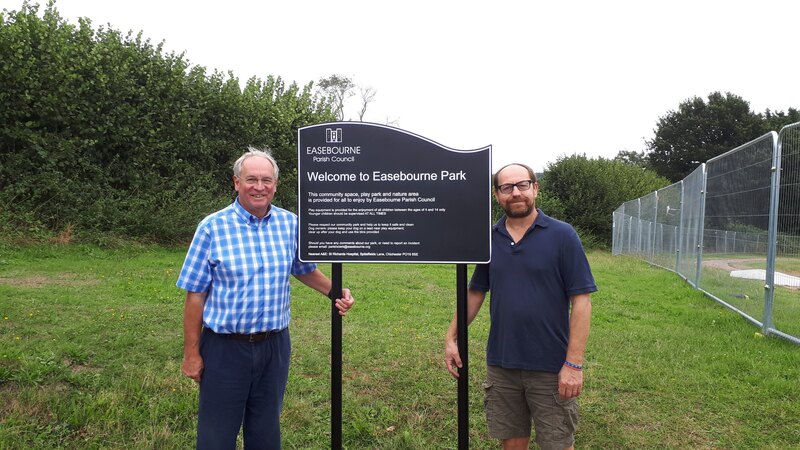 Easebourne Park is nearing completion with the erection of the Park welcome signs complete. 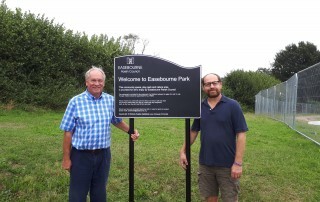 Easebourne Parish Councillors Ian Milne (left), Trevor Baker and Chairman Mike Noble (not pictured) comprised the work party. 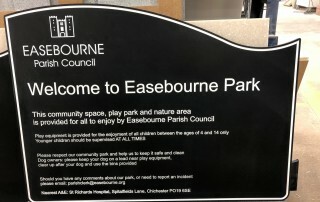 Easebourne Park is nearing completion! 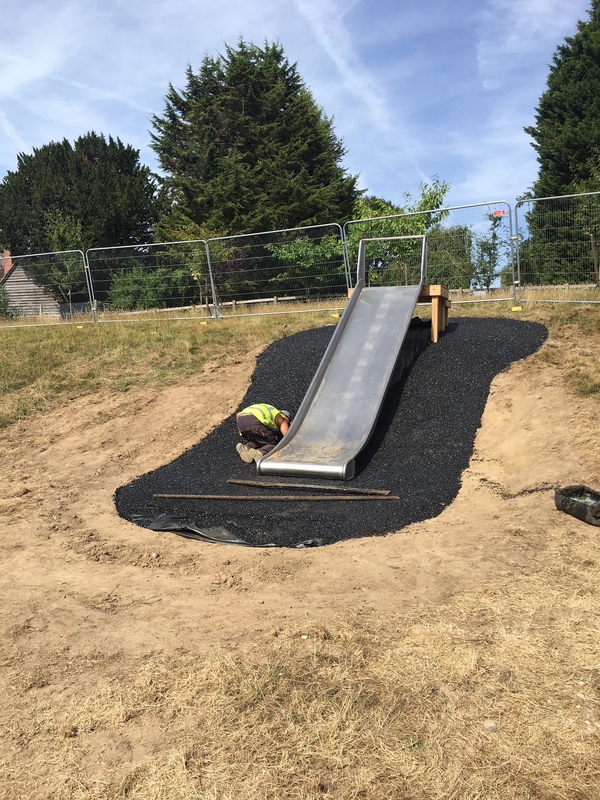 And the double size slide is nearly finished ….weeeeeeee! Whilst Velo South organisers CSM, extol the virtues of the event as economic, charity fund raising, health well being, county profile raising, community financial benefit, it is fair to say that this event has raised much disquiet amongst the communities directly affected by this route (route to be found on the Velo South website). WSCC is to issue Temporary Transport Restriction Orders (TTRO) which will legally close roads that form the route, legally clear any motor vehicles that are parked on the route (with or without the owners permission), and some roads that pass through villages are to be closed for more that 8 hours, although there will be some published route crossing points. These TTRO’s will come into force from midnight on 22/23 September and remain in force until the 15,000 riders pass. Considerable anger was expressed at a recent WSCC/Velo South meeting in Petworth, where the public and many parish councillors and other representatives from parishes and local communities affected by the event gathered to hear from WSCC and Velo South organisers. 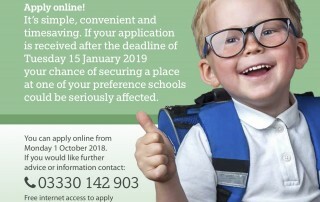 It was stated by many parish councillors that there had been no prior consultation with affected communities by WSCC before decisions were made to support this event. Additionally, with just 2 months to go, little effective communication had been received by communities and individuals most affected, from the Velo South organisers, CSM. CSM is a commercial organization, which has Sebastian Coe as Executive Chairman, and states on its website, that it is a “company of entrepreneurs, knowledge seekers and business leaders from across the sport and entertainment industry”. Finally, several business owners present at the aforementioned meeting, to include Cowdray Estates, were worried about the potentially negative effect upon their businesses these road closures would have as movement across the county, and into and out of the communities inside, outside, and on the closed road route, may be severely affected. Easebourne Parish will be fully enclosed within the Velo South route, although no Parish roads form part of that closed road route. However, if you are thinking of travelling on that day the Parish Council would encourage you to refer to this link: www.velosouth.com/ before making any plans. The Velo South Comms hot-line is 01243 935 359. Any closed road queries could be directed to Velo South on that number or on route@velosouth.com All 15,000 places on the event have been filled; however, the organisers stated on 26 July at Petworth, that there were a few remaining places available for entries from West Sussex cycling residents. Finally, travel disruption aside, the event should be an exciting spectacle, with 15,000 cyclists travelling at speed, along closed roads, in the most beautiful part of our county. 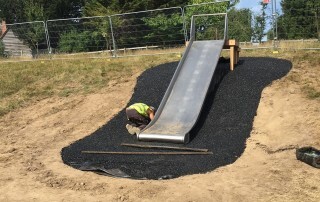 Wildwood UK construction complete and Playsafe Playgrounds begin work. The Wildwood trails and dens are complete – and magnificent they look as well. 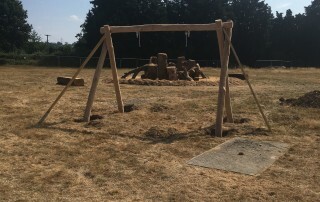 The carvings submitted by pupils of the two parish primary schools have been cut into the wood and add a essential touch of local interest. 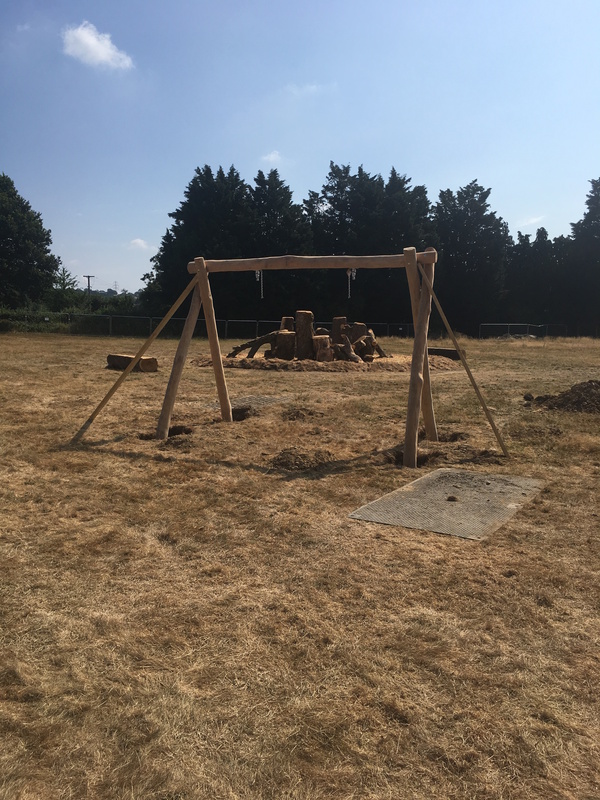 Playsafe Playgrounds are on site and cracking-on with their work on the surface trampolines, slide, zip-wire and 3 sets of swings. Once the site passes an inspection by a Royal Society for the Prevention of Accidents official, we will be open for business. The official opening is 1st September 2018 at 1.00pm – look out for your invitation soon.